Where do we find out-of-school children? How do we approach their parents? How do we setup a school at children's doorstep? What is an Educational Activity Center (EAC)? What are Balwadi, Study Class, Literacy Class? How do we ensure regular attendance of every child? What innovative tools do we design and use for teaching? How do we track every child's learning progress? How do we communicate the progress to their parents? How do we involve illiterate parents in children's education? What happens when the children migrate from this location? We, at Door Step School, have been asked these questions a lot of times before. And we have always happily answered them. But now we are bringing you an opportunity to experience this process for yourself. You can actually see how things work behind starting and running a school at a construction site or at a slum. 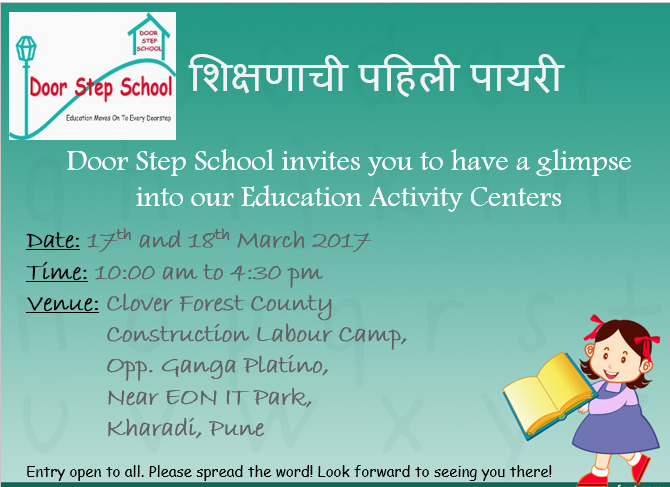 We will be exhibiting the steps and tools used at our Educational Activity Centers across Pune. 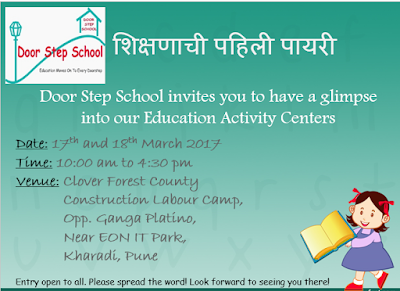 Door Step School team, along with some of the beneficiary children, will demonstrate the process and will answer the queries of visitors. Where: Clover Forest County - Construction Labour Camp, Opposite Ganga Platino, Near EON IT Park, Kharadi, Pune. Entry is open to all. Please spread the word among your friends, colleagues, and people interested in education.